You may or may not know that I have a crazy addiction to freezing things. Like, it's bad. I won't even tell you how many freezers I have, because you will judge me. What can I say?? We have the space, my husband loves me anyway, and it just makes my life SO MUCH EASIER to freeze all. the. things. For 800 years now I've had the dream to do a mega post for you entitled “Things You Can Freeze” (has a nice ring to it, right??) and bust out a giant list of aaaaaaaaall the amazing things you can freeze, but probably aren't. Have no fear! As mentioned, I'm all about getting shtuff done this year, and letting go of perfection (go big or go home doesn't always work…). Thus, my master plan of facilitating true love between you and your freezer WILL HAPPEN, but it will happen in stages. Stage 1: Sharing with you my best freezer meals by way of my new FREE Healthy Freezer Meals Ebook, and my other Freezer Meals Ebook. 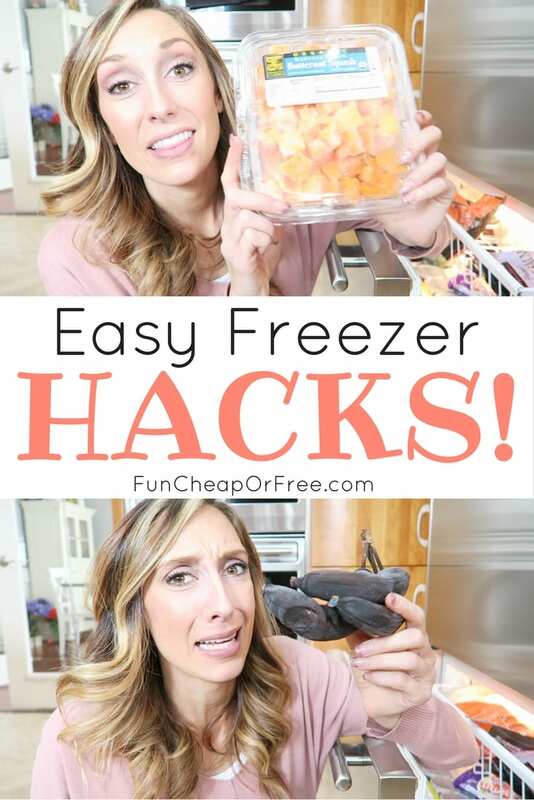 Stage 2: My Millennial Moms video this week which is me sharing with you some of my favorite freezer tips (or hacks as the world of YouTube loves to call them…) and some crazy things I like to freeze and why! Hopefully these little tips/hacks/ideas help give you confidence to conquer your freezer. So there you have it! Not too crazy, right? Get my FREE FREEZER INVENTORY SHEET HERE, as well as more tips! See all my other Millennial Moms videos HERE, and be sure to check out my own YouTube channel for more goodness like this! This is the vacuum sealer I have. I got it for Christmas from Costco, my mom got it when it was on sale. Use the code FCFBLOG to get 10% off my budgeting program, Budget Boot Camp, which teaches you all about grocery shopping, sticking to a reasonable budget, affording Target and all good things in life, and more! What are YOUR favorite things to freeze? What questions do you have about freezing? I plan to make more posts/videos about the subject so let me know in the comments what you want to know and I'll do my best to someday maybe somehow sometime actually tell you about them! Jordan. Dear, sweet Jordan. You have the same number of freezers as you do bank accounts and family members. I am just saying! How. Do. You. Fill. 7. Freezers? Hillarous! I love the freezer video you put on millennial moms. I want to get another freezer because I have 5 kids too and have been noticing that cooking chicken, cutting it up and putting it in portion size baggies is a game changer for lunch! It’s helping me get a healthy lunch in so I can lose weight instead of me just grabbing toddler food (corn dogs) or junk just because it’s quicker. Are you ever worried your electricity is going to go out and you will lose it all? Our electricity was out for about 10 hours yesterday and I started freaking out about losing all our food and we don’t have near as much as you. Um YES! Always a worry. We have a generator attached to our house for emergencies and if the power goes off, we just don’t open the freezer for as long as we can. Luckily it hasn’t happened to us in this house yet but if it does, we can hopefully keep things cool enough for those hours. At the end of the day, if the power goes off and we lose everything, we would also lose money. But the chances of that are slim compared to how much money we save using the freezers daily! You can totally freeze whole blocks of cheese and not have them be crumbly when defrosted! The trick is to let the block completely defrost at room temperature (on the counter) before putting it into the fridge. I learned this trick from an older friend and have been doing it for years without any problems. No way! So good to know, I’ll have to try that! For our family of 3, we have 2 freezers and they are both super full! We love to freeze everything! Hey Jordan!! Thanks for all your AWESOME tips, ideas, helps… Your positive energy helps my life in SOOOOO many ways! Just a fun tip for freezer that I’ve discovered is peel and slice your bananas!! You don’t have to worry about the peel, the sliced bananas are like CANDY in the summer to kids and they work better in the blender too!!! We have 4 freezers, they are wonderful! I’m horrible About freezing and if I do freeze I alwaays forget about it. How do you organize your freezer? We have an extra upright freezer, and I love it! I have started freezing all sorts of things, that I wouldn’t have thought to in the past. Thanks for all your tips! A freezer inventory sheet is brilliant! We often forget what we have buried and end up re-purchasing! Thank you for these tips! One of my fav videos! I love freezing things and learned a few more tricks from this video! I never thought about having an inventory list. Perfect for the chest freezer!